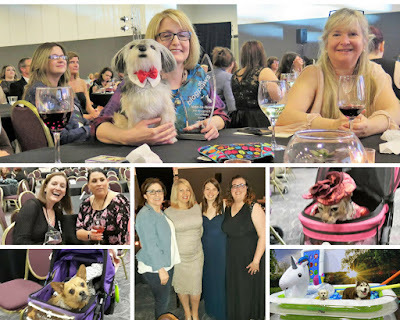 The BlogPaws Pet Blogging and Social Media conference in Kansas City was my 5th BlogPaws conference in as many years. When I think back I can't believe how much I've learned, how many amazing people I've connected with, and how far my blog has come. I've learned nearly everything I know about blogging and social media from BlogPaws, and the conference sessions are a big part of that. My blog would never have made it this far if it weren't for BlogPaws. Honestly, I probably would have quit blogging early on if I hadn't found this amazing community of pet bloggers! I'd like to share some of our conference highlights with you, in case you weren't able to attend this year. 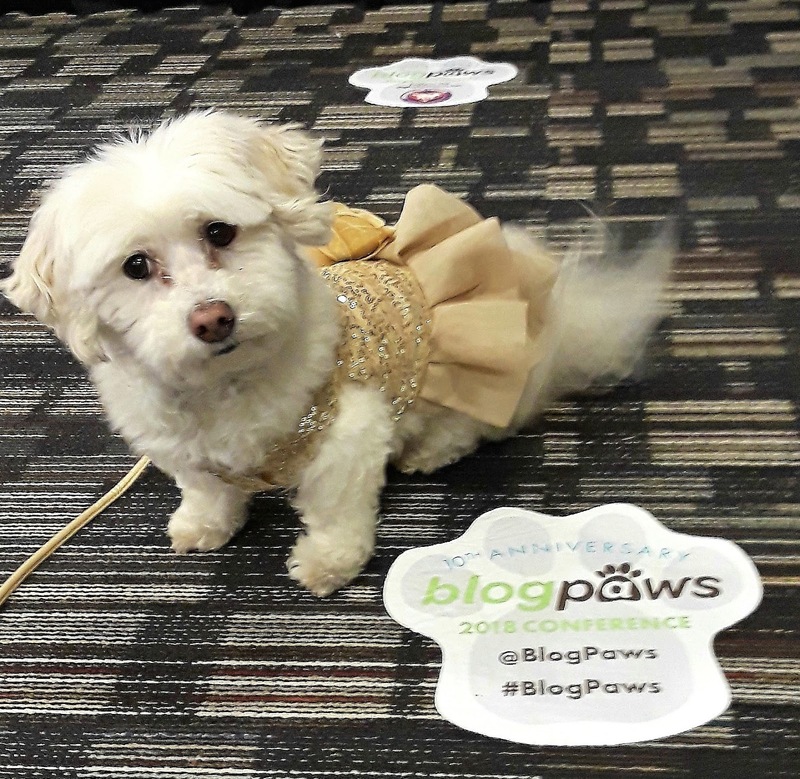 Phoebe posing at the 2018 BlogPaws Conference! Seeing my Pet Blogging and Social Media friends in person, as well as many of their pets, is the greatest. So many hugs, pets and belly rubs, & kisses go around! I also really enjoy meeting folks from brands I love and have worked with, as well as brands I'd like to work with in the future. It's a great opportunity to learn more about their pet products, create relationships, and find out about new products they might be launching. The educational working sessions and Keynote presentations are always so helpful to me in growing my blog and social media presence. Things change so fast in the online world, it's important to stay on top of the latest trends and best practices! The best part of the conference for me is seeing my blogging and social media friends to catch up in person! It's extra special when they bring their pets along. It's such fun when you get to meet in person, some of the pets you've come to know and love online. They're just waiting for pets, belly rubs, and kisses from everyone! Icy and Phoebe certainly got their share of blogger love! They made lots of new doggy friends and a few cat friends too. I've brought Icy and Phoebe to 3 out of the 5 conferences I have attended. I love having them right there with me, and everyone loves seeing them, including the brands! 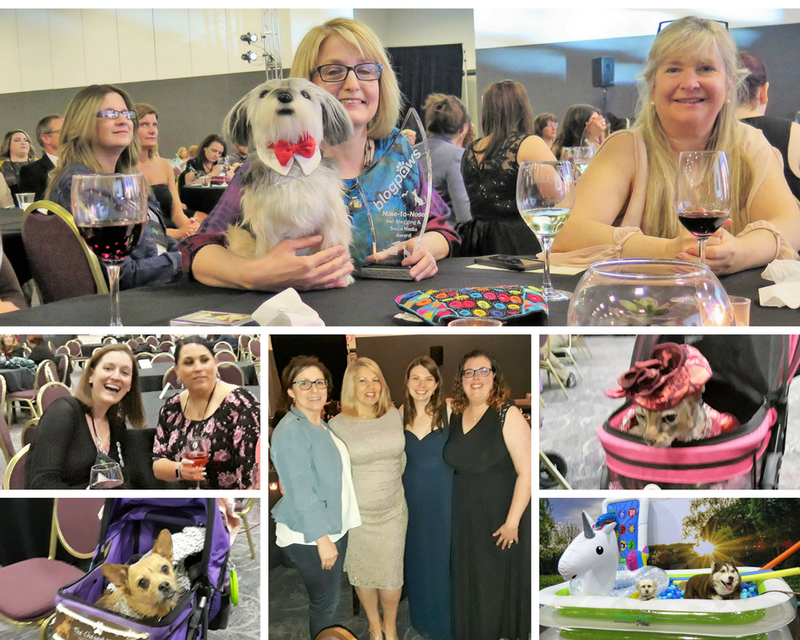 I created two Photo Collages highlighting just a few of the fun times we had with some of our blogging friends and our pets. I hope you enjoy them! So many awesome blogger friends and pets to connect with at the conference! Kristin Avery of The Daily Pip, Susan Nation of Talent Hounds, Maggie Marton and Aimee Beltran from BlogPaws, Alison Reder of Sarcastic Dog, Rochelle BaRoss of The Broke Dog, Bryn Nowell of A Dog Walks Into A Bar, Coco The Couture Cat, Jada from Chestnut Mutts, and my girls Icy & Phoebe taking a dip in the "pool" Frontline set up for everyone! 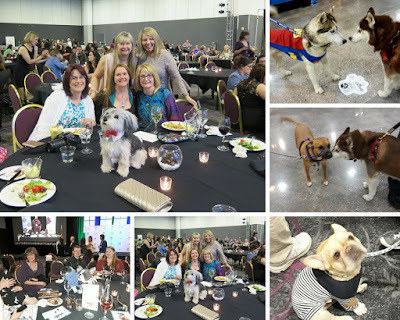 More friends & pets from the BlogPaws confeence! Each year I really enjoy seeing brands whose products I love and with whom I have worked. I always look for their booth's first! I try to interact with my favorite brands all year long online but there's nothing like seeing them in person and building relationships. It was great seeing the folks from Zymox, including little Seattle, she's so adorable! Zymox makes Oratene Brushless Pet Dental Care products, which I use for Icy and Phoebe. Pet oral health impacts pets overall health, but brushing your cat or dog's teeth can be so difficult - it is for me, anyway! Oratene's brushless products make it a lot easier. I've done reviews on my blog for Zymox during Pet Dental Health month (February) for the last 2 years, and I look forward to trying some of their other products like their Itch Relief Pet Shampoo and Rinse and their Wound Care products for pets. It's always a good time seeing our friends from Bayer Animal Health, makers of Seresto, K9 Advantix and other pet health products. It's always great seeing Bayer at the conference! Thanks to our friends from Bayer Animal Health I had the opportunity to visit the K9's for Warriors facility in Jacksonville, Florida last year. K9's for Warriors rescues shelter dogs and trains them as service dogs for military Veterans suffering from PTSD (Post Traumatic Stress Disability). With support from Bayer, they are doing amazing work! I always look for the wonderful folks from VitaBone at the conference! My dogs love VitaBone's Artisan Inspired dog biscuits like Artisan Turkey, Stuffing & Cranberry flavor and the BBQ Chicken & Sweet Potato flavor biscuits - YUM! I was too busy chatting with them (they don't call me Chatty Cathy for nothing, you know, LOL!) 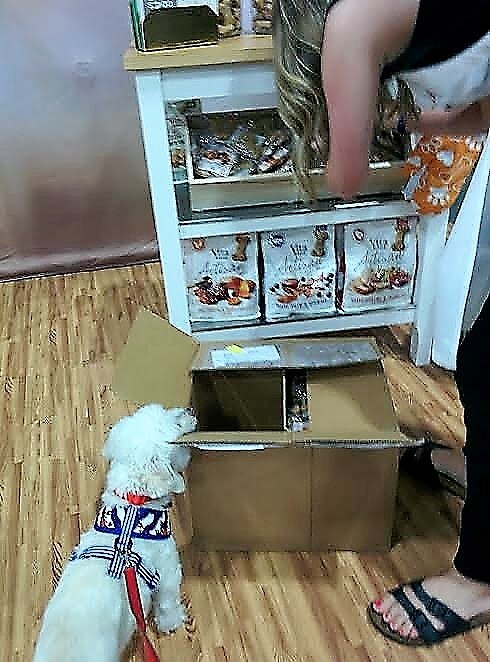 so I didn't get a photo, but here's a cute photo of Phoebe at their booth last year, sniffing out a box of their goodies! Phoebe always looks forward to samples of VitaBone goodies at the conference! It was also great meeting the folks from Chewy.com , since BlogPaws and Chewy are now one big pet loving organization! Icy and Phoebe posed in front of this backdrop, which Chewy put up in the Exhibit Hall to hint at where next year's conference is going to be. After seeing this backdrop I had a feeling it would be in Florida, especially since Chewy's headquarters is in Dania Beach, Florida. It was revealed on the last day that the 2019 conference will in fact be held somewhere in Florida. We're excited because we love Florida, and we hope to be there for the conference! We took Icy and Phoebe to Florida in February to visit family and have some fun in the sun. Check out our Florida adventure posts Dog Friendly Juno & Jupiter Beaches and Dog Friendly West Palm Beach! Friends, don't be too surprised if we move there next year! 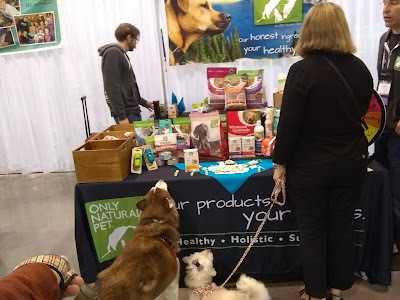 I really enjoyed chatting up Only Natural Pet, all natural pet products. I'm very interested in supplements for Icy and Phoebe so I asked them lots of questions about that. I appreciated all the information and the wonderful product samples they gave us! Icy and Phoebe were so curious about all the samples Only Natural Pet had out! Icy and Phoebe were very curious about all the products Only Natural Pet had out, especially the Bone Broth, Rabbit Treats for cats, and Salmon Oil! It's always nice to meet new brands and learn about their products. We met DOOG Dog Owners Outdoor Gear, ECOS earth friendly products for pets and people, and WAHL, makers of quality grooming products for pets and people. My husband loves Wahl and uses several of their grooming products - the ones for humans of course! We were impressed by ECOS eco-friendly products, derived from replenishable resources. Icy checking out some of the cool outdoor gear from DOOG. There were so many other great sponsors at the conference, far too many to mention here! I always leave the conference wishing I had more time to spend with friends and talk with brands reps! Jenny Guy from MediaVine spoke to us about building the relationships you want with brands. One of her many tips that resonated with me was to Add links to a few of our Most Popular Posts to our blog's Home page or About page. Why didn't I already have that?! It was the first thing I did when I got home, I added links to 4 of my most popular posts to my About Me page. Depending on what platform you use it might easy to add them to your Home page as well. Jenny also mentioned how important it is to send the brand all your links, including social media shares, following publication of sponsored posts you've done for them. She stressed the importance of maintaining overall communication with the brand throughout the campaign process as well. BlogPaws Executive Team member Felissa Elfenbein talked about creating engaging content that gets seen, and the importance of working to build up your community. She advised us to create authentic content people can relate to and share that content at the right times when our followers are online. She also pointed out that we should share all our content as diligently as we share our sponsored posts. SEO expert Jill Caren, who owns both 2 Dogs Media and Charity Paws, had great suggestions. One of the first things she talked about was hosting your blog on a quality site. Just because a site hosting company seems popular it doesn't mean their quality is better, so do some research and choose a host for your site carefully. Jill advised that we'll never know what Google is looking for when we rank in search so don't try to figure it out! We are better off thinking like the end user (reader), what they'll be looking for and the purpose of our content. She cautioned us against over optimizing keywords, saying you don't need to put the same keywords into one post 15 times. That was interesting, I always thought I should try to add keywords many times throughout my entire post - the more the better. Obviously not! I'm glad to hear that, I never want my posts to sound robotic or inauthentic. The flow of our content should be natural. Authenticity and Engagement was a common theme among pretty much all the keynote speakers and working session presenters. It's hard not to focus on "the numbers" in your blog stats, but an authentic voice and natural engagement seem to be the thing brands value most when they look for bloggers to work with. I know, it's hard to believe the numbers don't rule brands' decisions in choosing bloggers to work with, but that was a key message we heard from speakers. The numbers can't be ignored for sure, but we shouldn't get so hung up on growing our blog and social media stats that we lose site of our passion and why we started blogging in the first place. It's amazing to come home with what looks like a truckload of Swag from all the generous conference sponsors! It's a great way to discover and try new products from brands we love and from new brands whose products we're not yet familiar with. What do you mean I have to share some of my conference treasures?! We got so many great products in our swag bags and at sponsors' booths, this isn't even all of it! Icy and Phoebe want to keep everything for themselves! I hate to be a buzz kill for them, but I always share some of our swag with their dog friends, and our local animal shelter. The conference always goes by so fast! We look forward to it all year and in what feels like the blink of an eye it's over. We hope to be able to attend next year's conference in Florida! Did you attend the BlogPaws conference this year? If you did, leave a comment & tell us what your favorite thing was about being at the conference! I'm sorry I missed the conference this year. I would have loved to have met you in person. 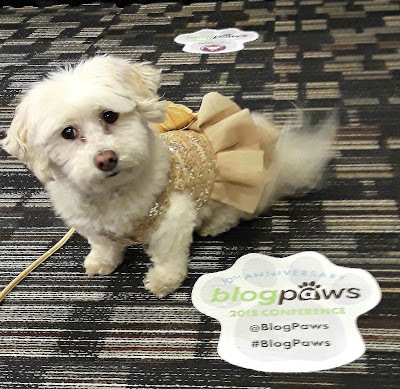 Thanks for sharing your experience at BlogPaws. I didn't attend however living vicariously through you and the other attendees this year! Look at all that swag!! My goodness. Learning, fun and goodies oh my! Me too Kamira, I hope we will get to meet in person in the near future! I'm glad you were able to follow along and join in that way. It's always great to see everyone. It's a lot of fun and so helpful in terms of learning and discovering great new products. Please don't hesitate to reach out to us if you have any questions about Mediavine! Our current threshold is 25,000 sessions/month and we'd be so thrilled to have you when you get there. 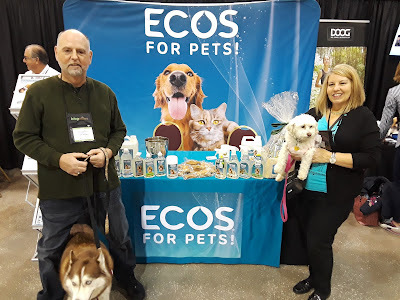 Thanks again for mentioning us in a great recap of BlogPaws! Thanks so much Susannah! Jenny's session as well as her Keynote presentation were terrific. She shared so many helpful tips. I'm glad you visited my blog and that you liked this post, thank you! I also really appreciate that you provided the numbers you are looking for, so many organizations just don't share that but it's very helpful. I'm Gonna Wash That Itch Right Outta My Fur!